On one of the last warm days before winter set in, more than 200 students flocked to Scott Circle on Oct. 24 to take advantage of some rare visitors to the Evanston streets – a crew of eight Chicago-based food trucks. At 5 p.m., when the food truck rally was scheduled to begin, students were already lining up in droves for their first courses. The attraction was simple. As sophomore Tralon Williams put it, “I like what I’m smelling.” He added that the trucks had instant extra appeal on a college campus – they’re not serving dining hall food. Representing a healthy sampling of the Chicago food truck scene, the lineup had a range of sweet and savory options on offer. The Slide Ride, which specializes in juicy mini-burgers called sliders, and the Wagyu Wagon, with a menu grounded in half-pound high-quality beef patties, attracted most of the early arrivals to the event. Meanwhile other students did dessert first, opting for the sweets-selling Sweet Ride, Chicago Cupcake or Beavers Coffee and Donuts. 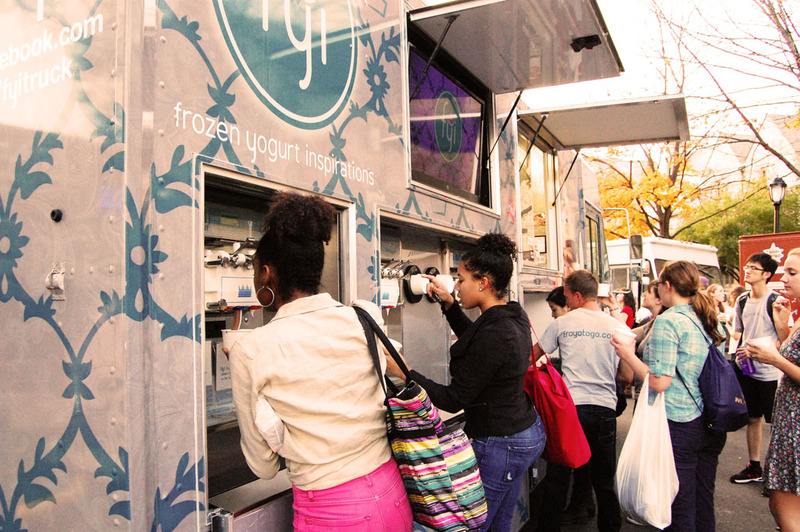 FYI, a self-serve fro-yo truck clearly benefitting from the unseasonably pleasant weather, gathered a crowd with uncommon flavors such as New York cheesecake and a smorgasbord of available toppings. Adding some more culinary variety to the group was the Tamale Spaceship, serving up a Mexican dish filled with various meats and chesses and garnished with everything from purple pickled onions to grilled pineapple. Haute Sausage rounded out the circle, going way beyond the classic Chicago dog with options like duck foie gras and okra alligator sausages. It wasn’t only the rare access to some unique foods that students appreciated about the food truck rally. “I like the atmosphere it provides,” freshman Zachary Woznak said. Attendees clustered in the middle of the circle as they scoped out their options, then perched on the curb along University Place to eat.